Black and white image of a large building with a stair-step false front. Two garage doors open out on either side of a central area with display windows and a recessed entrance. Four men stand at the image left of the building, three in overalls with aprons and one in business pants and a dress shirt. One truck is parked half in and half out of the garage door next to them, and another truck is parked along the curb in front of the main entrance. 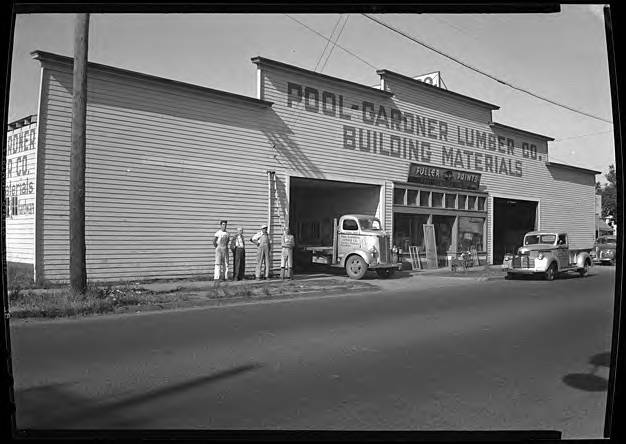 Signs on the store indicate that it sells building materials and Fuller paints. Screen doors and window screens lean against the display windows. This images was part of the Herbert McMullen bequest. McMullen was a local photographer who also collected other images of daily life in the area.